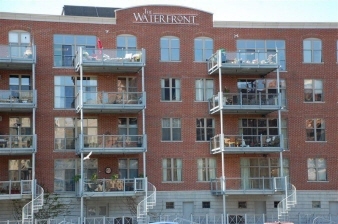 Amazing quality and value awaits you in this great two bedroom, two bath unit at The Waterfront. Magnificent kitchen with granite entertainment counter. Open living room boasts hardwood floors, gas fireplace and sliding doors that lead to 14' x 12' balcony. The master bedroom features walk-in closets and adjoining luxury bathroom. Parking for two cars. One car garage with storage, and one tandem outdoor space. Private Remarks: 2 Car Parking: Tandem Garage & Outdoor Spot #63. // Pet Policy: One small dog and one small cat, 40 lb. weight limit.